Andy Warhol's affinity for women's shoes as subjects is well established. Early in his career Warhol drew whimsical illustrations of women's shoes for the department store I. Magnin and Glamour magazine, drawings which won the artist acclaim and financial independence. Some shoes were illustrated using a blotted ink method and either colored in during "painting parties" or collaged with gold leaf. His mother's familiar looping script assigned the shoes names and celebrity status: Julie Andrews, Zsa Zsa Gabor and Shoe Perdu. 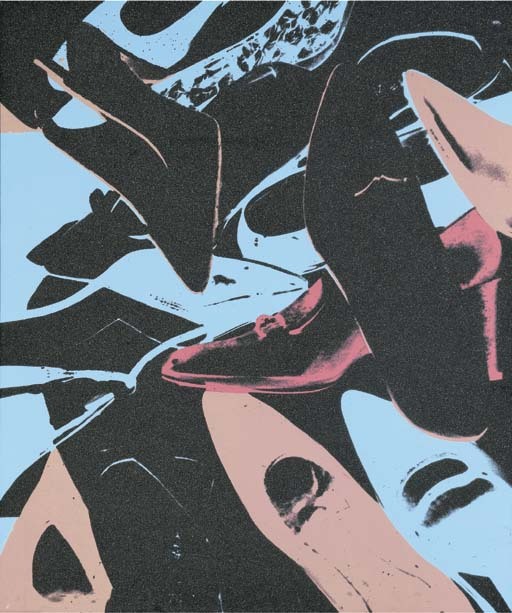 Warhol's series of Diamond Dust Shoes, which he began in 1980, developed shortly after the artist started experimenting with the application of diamond dust on the surface of canvas and paper. Although Warhol first experimented with actual diamond dust, it proved too powdery and not as visually affective as the ground glass that he eventually chose to use. Vincent Freemont writes, "With the Diamond Dust Shoes Andy was able to combine some of his favorite themes -movie star glamour, high fashion and money. The merger of women's shoes and diamond dust was a perfect fit...Andy created the Diamond Dust Shoe paintings just as the disco, lamé, and stilettos of Studio 54 had captured the imagination of the Manhattan glitterati. Andy, who had been in the vanguard of the New York club scene since the early 60's, once again reflected the times he was living in through his paintings" (V. Fremont, Diamond Dust Shoes, exh. cat., Gagosian Gallery, New York, 1999, pp. 8-9).